The enemies of your car during this period are moisture, cold, corrosives and vermin. An inside storage place should have a reasonably cool, even temperature, a minimum of dirt in the air, and an absence of direct rays from the sun, which might cause uneven aging of painted surface and upholstery and accelerate deterioration of tires and rubber parts. If it is necessary to store cars near windows, sunlight may be effectively reduced by painting the window pains black or blue. Avoid storing in a place where coal, smoke, ammonia or other detrimental fumes are present. Placing a heavy sheet of plastic on the floor and driving your car in on top of it will help keep moisture away from the car. Another thing that helps keep the dampness away from the car is to make long bags out of loosely woven material and fill then with shredded newspaper, lay these all around the car, the newspaper will absorb the moisture. Change the Oil & Filter. Flush your Cooling system and Heater lines. Refill with new antifreeze. Then run the car until it warms up to spread the new fluids, also if you have air conditioning be sure to run it during this final warm up. After putting the car in storage, recheck that the systems are full. I’ve seen two different suggestions as far as Gasoline is concerned. The first and most popular one is to fill the tank and about week before you put it in storage add a can of dry gas or fuel additive, to clear the system of moisture. The second is to drain the gasoline tank. Run the engine until it stops, using up as much as possible of the remaining fuel. Disconnect the carburetor gasoline line at the fuel pump to allow gas to drain from this line. Disconnect tank to fuel pump line at fuel pump and blow line out with air. Crank the engine over five or six times to empty pump. Reconnect both gasoline lines. The car should be thoroughly washed and waxed prior to storage. Some suggest you apply a second coat of wax and let it set without buffing. A cloth or paper cover should be put over at least the roof, hood, and front fenders to keep them free from dust accumulation and also as a precaution against foreign matter falling onto the paint, through windows or other openings. If you use a car cover be sure it can breathe, plastic sheets often trap moisture and should not be used. Clean all exterior chromium plated parts with chrome cleaner and polish, and apply body wax or chrome guard as a protective coating. Petroleum can be used as a protective coating, but it collects dirt and is therefore troublesome to clean off when the car is removed from storage. All upholstery and floor coverings should be thoroughly cleaned. Leather and vinyl treatments will help these substances last longer and prevent cracking. The entire interior should be sprayed with a stainless moth preventative, such as dichloricide. Or you can try putting cedar shingles in the car these not only help keep out the insects but also cut down on the moisture. You can also put Dry Pack in the car to cut down on moisture. Apply a high quality furniture wax to the decorative wood inserts in the interior. Make sure to periodically clean the interior to deter mildew and dry rot. Precautions should be taken to keep rats, mice, or other vermin from reaching the interior. It is recommended that doors and tank be left closed. Apply body wax to the interior chromium plated parts. All rubber weather-strips such as used around doors, deck or trunk openings, and window ventilators, as well as rubber gaskets with exposed edges around tail lights, cowl ventilator lid gaskets, etc., should be painted with silicone grease. Place the car in the location where it is to be stored and support on jacks or stands at all four wheels to relieve weight from tires. Thoroughly lubricate all the chassis points, door, hood, truck latches. Bleed the hydraulic brakes to remove any moisture and sediment. Remove the spark plugs and squirt a small amount of oil into the spark plug holes after the car is cooled. Turn the engine over with the starter to spread this oil into the cylinder walls and rings then replace the spark plugs. Wipe the inside of the distributor cap clean of any dust and moisture using a clean rag dipped in alcohol. Place paper bags over the carburetor air cleaner, crankcase ventilator valve outlet, and tail pipe, securing them in place with twine. This is especially important when storing cars in locations near the seashore, where salt air might enter the engine or exhaust system. If car is to be stored more than one year, remove the cylinder head and coat all internal parts of the engine (Cylinder bore, combustion chamber, valves and seats, valve stems, etc.) with cup grease. Move the generator toward the engine as far as possible to relieve tension on the fan belt. Remove the battery and clean it of all dirt and grease. Dry the case completely. Set the battery on wood rather than concrete or metal. Current can leak though those substances. Clean the terminals and cable ends. Be sure to fill the cells to proper level. CAUTION: As part of the normal function of a automobile storage battery, hydrogen gas is produced through chemical action. This gas is toxic and extremely combustible when mixed with air. Do not store battery where it will be exposed to sparks or open flame, nor where it is exposed to children. Note – If car is to be stored for over one year, it might be wise to sell the present battery and purchase a new one when the car is put back in service. The tops of convertibles should not be collapsed. Care should be exercised to keep oil or grease of any kind from top. Put paper cover over top, to prevent dust and dirt from penetrating the fabric. Coat folding top chromium plated parts with body wax. Do not store in direct sunlight. 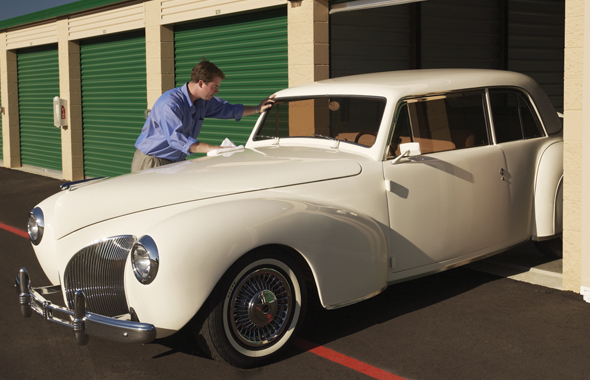 Some owners prefer to start a stored car once a month. This can be done but remember to vent the exhaust outside the garage, Carbon Monoxide Poison can be a real danger. If your car has air conditioning or power steering, exercise these during these winter start ups to lubricate these systems. Check truck, engine and interior periodically for signs of pest or vermin and take any necessary precautions. This entry was posted in automobile self storage on January 14, 2016 by admin.